A protected minimum grid, for maximum impact. On March 23rd, the project manager of the Integrated Mobility Plan (IMP) spoke at the Transportation Standing Committee and stated that a minimum grid of bicycle lanes is one of the Big Moves needed to shift the transportation system in Halifax. “We have heard loud and clear from the community that they do not want just one bicycle lane, but a network of high-quality protected bicycle lanes”. We have had a taste of bicycle infrastructure with several painted bicycle lanes and the first protected bike lane on Rainnie Drive. It is now apparent that the next step for Halifax is to follow the example of our peers in Calgary, Victoria, Edmonton, and commit to making a minimum grid of protected bicycle lanes in the Regional Centre. 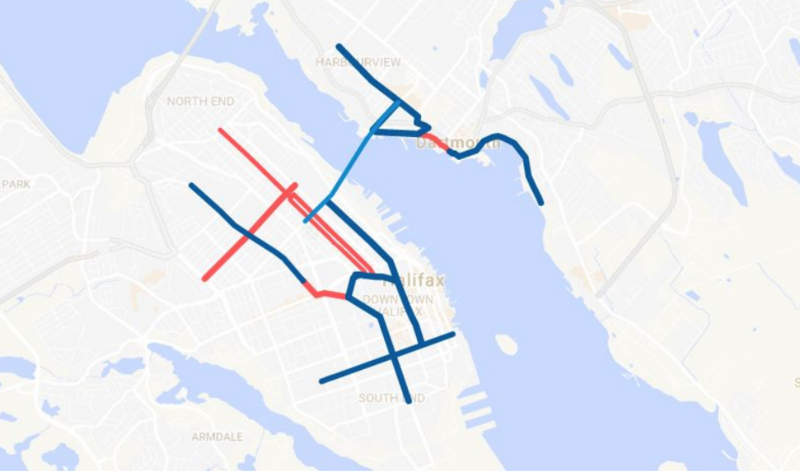 A potential minimum grid network for Halifax and Dartmouth (Blue= current or upcoming projects, Red= new projects/key connections). The city’s current projects put Halifax in a good position for a minimum grid to be realized. The map above shows that, by enhancing existing bicycle lanes and upcoming projects, there is a good foundation for a network spine. Enhancing existing bicycle lanes and creating high-quality, separated bicycles lanes on new routes at once to form a network, will ensure consistent quality and a faster installation. Implementation of a pilot network A 10km network of bicycle lanes can be installed quickly and easily. By conducting the design, consultation, and implementation of a bike network as one project, we maximize that impact of our investment. We know 60% of people who are too afraid of riding a bicycle beside traffic and will only begin riding if they feel safe for the whole trip. The benefit of piloting a network all at once means that instead of waiting years for the connecting projects to be installed, you get to experience a network of bike lanes from the beginning. Prioritize quality over quantity. If we truly want to make riding a bicycle a great experience in Halifax we have to invest in highest quality infrastructure. Minimum grids typically range 5km- 10km, because evidence from other cities indicates that it is better to have fewer separated bike lanes that connect, than to have a many start-and-stop painted bike lanes that do not get you to the door of your destination. If we focus on building separated bike lanes on key corridors first. This will be the first step of a multi-phased approach to create a finer-grained network in the future. A minimum grid is successful when it makes the most popular destinations in the city accessible by bicycle. These are the streets we frequent on a daily basis to access services, shops, entertainment and experience public life. The majority of bicycle trips are less than 7km and minimum grids provide a safe and enjoyable route to the places where we travel most often. Let staff know what you want to see from a protected minimum grid. Attend one of the Integrated Mobility Plan listed below or e-mail Halifax’s AT coordinator Mark Nener nenerm@halifax.ca and CC contact@cycleahalifax.ca to show support for a minimum grid of protected lanes in the Halifax Regional Centre. Cole Harbour Place (Westphal Room) – 51 Forest Hills Parkway, Cole Harbour 6-8:00 p.m.
Central Library (Paul O’Regan Hall) – 5440 Spring Garden Road, Halifax 12 noon – 2:00 p.m.
NSCC Technology Campus (Atrium) – 5685 Leeds Street, Halifax. 6 – 8:00 p.m.
NSCC Waterfront Campus (Presentation Theatre) – 80 Mawiomi Place, Dartmouth. 6 – 8:00 p.m.
Ecole Secondaire du Sommet (Cafeteria) – 500 Larry Uteck Boulevard, Halifax. 6 – 8:00 p.m.
Acadia Hall – 650 Sackville Drive, Lower Sackville. 6 – 8:00 p.m.